Each minor adjustment can create a huge change in the final photos meaning and look. One of my goals on the #baltictoysafari was to try to recreate this shot at the Vaxholm castle on our dawn photo shoot. I thought dawn would be an interesting golden hour opportunity as well as the backdrop of the castle seemed rather fitting. I wanted to give you a glimpse of what it looks like through my view finder. In this series of photos you can see the light change, the clouds move across the field of view and even a bird is caught as it flies by. You can also see how I am constantly changing my angle to the subject, shifting how the subject fills the frame, even repositioning the claws and wings at one point. Each small change, each subtle choice, had a huge impact on the final image. Even though I wanted a vertical image, I ended up liking this horizontal image best. I am still not happy with the final result; I don’t think I improved on the original image. 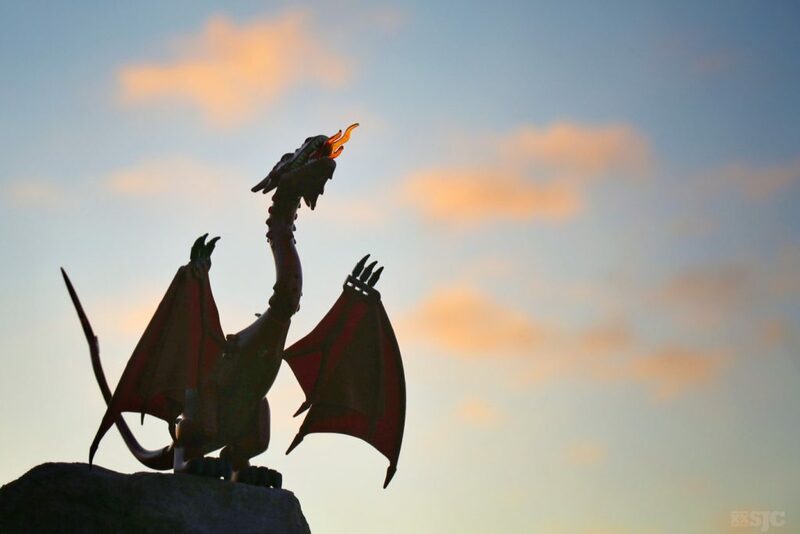 I am not sure if it is the change in dragons (Kingdoms vs Smaug) or if it is the translucent nature of the dragon in the original shot which makes for a more interesting image. Maybe it’s a size issue? The first dragon is actually smaller and fills the frame differently than Smaug, it creates a better balance. I guess I will need to take them both out and try this again. The choices we outdoors photographers make, need to be made quickly. The constantly shifting light makes speed important. While practice and experience can help overcome this challenge success is never assured. But with each successive attempt something interesting can be learned, with each small adjustment something new is revealed. It is this sense of discovery that has kept me fascinated with the photographic process for all these years. This wonderful challenge of making a series of small choices that will lead to the perfect image. I will admit I did learn one valuable lesson from this whole experience: dawn is a pretty wonderful time to be shooting LEGO. I may just have to get up early and try this again; just not 4:00 am. Thank you Boris for introducing me to this special time of the day. 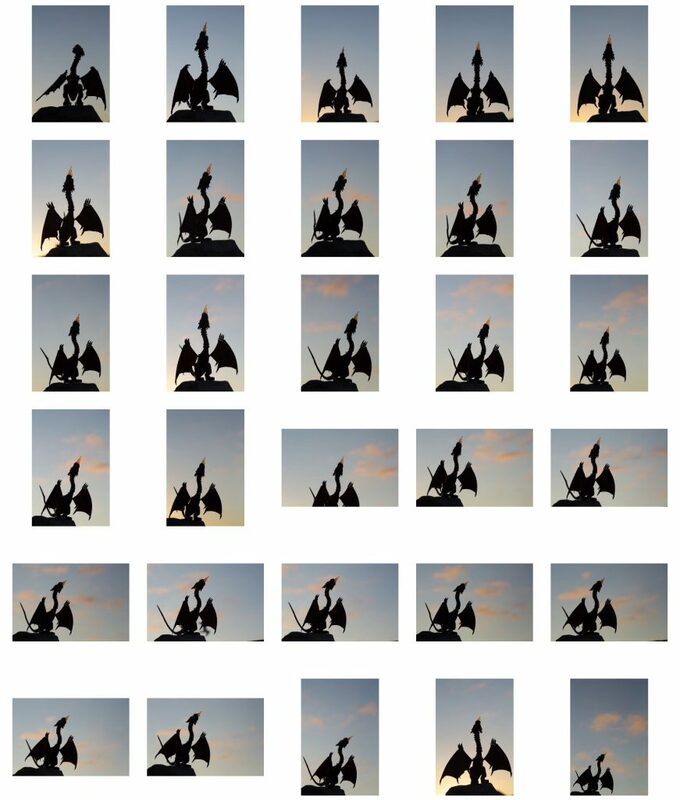 From this “contact sheet”, which image would you choose to edit? HmHmHmmmmm…..- though not at all a photographer I think I do understand. To me the main problem is that the dragons are very different. I do prefer the smaller one with it´s shorter neck. And yes, the translucency works perfect with the light shining through. I think that´s what makes it that hard to re-shoot the first image. To me the one image on the far left bottom seems to work best. Tough choice! For me it would be a toss up between the first photo for the anticipation of flame (although maybe that wouldn’t work if I hadn’t seen the flames in all of the others) and the second one on the third row. The sunrise gradient and the symmetry do it for me on that one. I can’t understand more the difficulty it is to choose between many pictures of the same subject which one is the One. 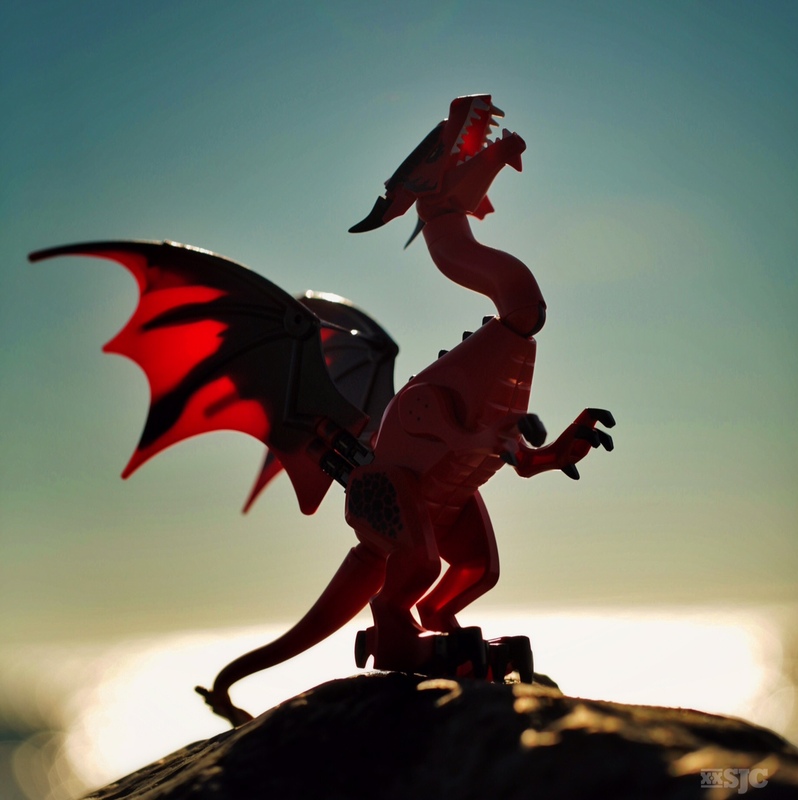 While I don’t often have this problem with toy photography (or at least when it happens it’s much more simpler to solve) it often happens when I travel and I take pictures of a place at sunset or sunrise. It’s the kind of moments where I spend one or even two hours in front of my camera, taking sometimes more than two hundreds pictures because I know that I won’t have another chance at taking the picture and I want to be sure I won’t miss the best lightning and sky I can have for that particular sunset/sunrise. But having to choose in the end a single picture to upload online is very time consuming. I found that proceeding by elimination is quite effective. Than I post-process the few ones left and I wait a few days (sometimes weeks or even months…) before deciding (again often by elimination) which one I will finally upload. But at the very far end I sometimes feel that the final choice is rather random and I wonder if it was the right choice or not. I always take 3 or 4 photos of the same subject. I’m always in doubt to choose the correct one! So, I look at every picture for a minutes to better decide. I keep them for the future anyway, in case I want to show bts or multiple choices.